This is temple is in worship since its inception as evident from inscriptions found at the site. As the worship still continues, therefore entry of a foreign national was not allowed earlier and this is the reason that this temple was not described by the early European travelers. The fate of the temple has not changed in the modern times as well. As the temple is under worship, it is kept open only for a short period, in the morning and evening, during prayer times and for the rest of the time, it is kept closed. Due to this reason, many modern visitors and tourists skip the visit to this temple. However obscure or inconvenient the access may be, this temple is one of the best preserved and most complete specimen of the rock-cut architecture at Mamallapuram. The temple has been modified with extra structures, most probably during the sixteenth century CE when the town witnessed resurgence during the Vijayanagara period. A modern structure, in front of the temple, restrict the view to its original shrine. The original edifice is a west facing cave temple, measuring 30 feet x 14 feet x 11.5 feet1. The cave is excavated into a hall consisting of two bays. This is supported on four pillars and two pilasters. The pillars are of lion-base variety with octagonal shafts. The temple is dedicated to the Varaha incarnation of Vishnu, a stucco image is carved at the back wall of the shrine. The image is heavily colored and modified. It would be difficult to aeration whether the stucco image is on top of an old Pallava image or an addition during a later period. The sanctum is adorned with a mandapa in front, flanked with dvarpalas on either side. Lockwood2 mentions that one of the dvarpala has shankha and one has chakra carved on his head, which suggests that the shrine was dedicated to Vishnu. There are various figures executed on the interior walls of this cave. These figures are explained in detail below. Shiva is represented as Gangadhara in one of the panel. He is shown with four hands, in one of his hand, he is holding his tresses to accommodate Ganga. Ganga, in her female form, is shown in one corner, descending towards the held tresses. There are no attendants, devotees, mounts or other figures in this panel such as the god and the lady are left alone to carry out their business. Gangadhara seems to be a famous and frequented icon during the Pallava period.We have two Gangadhara images, which can be predated or contemporary to this image. One is the Gangadhara panel at Tiruchirappalli and another is an image on Dharmaraja Ratha. Gangadhara of Tiruchirappalli cave is considered as a Pallava masterpiece and it predates the one discussed here. This Gangadhara theme at various Pallava edifices can have a significant bearing on the theme of the Great Penance panel, which is taken in detail in a different chapter of this article. Opposite Shiva is placed Brahma. He is shown with four hands, carrying rosary in one hand, placed one hand on his waist and one hand in abhaya-mudra. He is standing alone, with no companion or devotes. The proportions of this image are somewhat skewed as his upper arms are somewhat placed too away from his body. Lakshmi, shown seated on a lotus seat and carrying lotuses in her two hands. She is accompanied with four maidens carrying water pots and other toiletries. Two elephants on top corners, flanked on her either side, are on process of spilling water such as to give bath to the goddess. She is popularly known as Gaja-Lakshmi when depicted in this form. The icon has generated much debate upon being influenced from the Buddhist icon where elephants are shown giving bath to the queen mother Maya. Facing Lakshmi, we find majestic panel depicting Durga. Shown with eight hands, carrying shankha (conch), chakra (discus), bow, sword, shield and a bell. A parrot is perched on her lower left arm wrist and it seems to be looking at what she is holding in her lower right hand. she definitely holds something in her lower right hand. It appears to be a blood-bowl as held by Chamunda or Kali. She stands in a tri-bhanga posture above a severed buffalo head. The buffalo would be representing the demon Mahishasura. Behind Durga is a standard top of which is in form of a trishula (trident). A lion and a deer, both are mounts of Durga, are shown in the upper corners. Near these animals are ganas, one on either side of Durga. She is accompanied with two female guardians, one bearing a bow and one sword and shield. There are two devotees near her feet. One of the devotee is process of cutting flash from his arm3. Next, right side of the sanctum entrance, we find Harihara, a composite form of Shiva and Vishnu. He is shown with four hands carrying parashu (axe) and chakra (discus). He is shown standing below an umbrella or parasol. Two devotees, one on either side, are shown near his feet. H Krishna Sastri4 raised a doubt on this icon being identified as Harihara or Sankara-Narayana, as he mentions that the icon should hold an axe or trident in his right hand and conch in his left hand. As per him, the icon in this temple holds a chakra and rosary. He is right for chakra however this icon does not have rosary but an axe in this case therefore its identification as Harihara is correct. A four-armed Vishnu image is placed on the left of the sanctum. Two devotees are shown kneeling near his feet. In the next niche is Shesha, shown with seven-hooded anthropomorphic character. Now we come of the portrait sculptures of this cave. These portrait sculptures are one of those very few such sculptures found in the whole dimension of the Indian art of that period. These are the portraits of the Pallava kings and also bear inscriptions however the identity of these kings has not yet reached consensus among the scholar community. 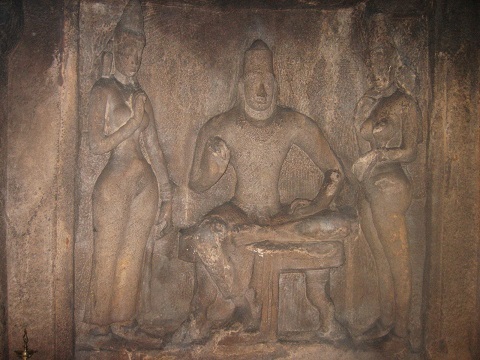 In one panel we see a king seated, in sukhasana posture, on a seat, with two of his standing queens. The king’s one arm is in chin-mudra or contemplative posture, suggesting that he is professing some idea. Shown with minimal jewelry, the king and the queens compliment the serene environment of the temple. The inscription above this panel reads, “the glorious athiraja (adhiraja) Simhavinna-Potrra (simhavishnu-Pota)”. This Pallava king has been identified with the Pallava king Simhavishnu by Lockwood5, R Gopalan6, Dehejia & Davis7 with the Pallava king Narasimhavarman I by H Krishna Sastri8 and with the Pallava king Narasimhavarman II Rajasimha by R Nagaswamy9. Opposite to the above panel, is another panel displaying another Pallava king. The king is shown standing with his two queens, and he has raised one hand pointing towards the Durga panel. He is holding hand of one of his queen, who might be the senior or chief queen. The inscription above the panel reads “the glorious athiraja (adhiraja) Mahendra-Pottra”. This king has been identified with the Pallava king Mahendravarman I by Lockwood10, S Krishna Sastri11 the Pallava king Mahendravarman II by T V Mahalingam12 and the Pallava king Mahendravarman III by R Nagaswamy13. Lockwood mentions that these label inscriptions were engraved above the two portraits panels more than century after the creation of the temple. Before we look into the issue of the identification of the Pallava portraits, let us visit the riddle associated with the imprecatory verse engraved on the floor of the cave hall. This verse speaks about a curse to those who do not follow Rudra or Shiva. Isn’t it very strange to find such a verse in a temple which is dedicated to Vishnu and that too engraved on the floor? Indeed it is surprising and therefore it is assumed that this verse would have been engraved after the construction of the temple. But by whom and why?What would be the reason to engrave such a horrific verse cursing those who do not follow Rudra? It can be safely assumed that it was engraved by a staunch follower of Shiva. Mahendravarman I and his son, Narasimhavarman I can be ruled out as we do not find any such strict association with their character, either in the monuments they built not in the Pallava epigraphs. We may also rule out Mahendravarman II, son and successor of Narasimhavarman I, as he ruled for a very brief period of 2-3 years. After him, there were only two Pallava kings who can be referred staunch Shaiva, and they are Parameshvaravarman I and Rajasimha. Parameshvaravarman I, in his Vunna Guruvapalem grant14, is said to be staunch follower of Maheshvara (Shiva). Rajasimha, in his Reyuru grant15, is said to be staunch follower of Vishnu, Shiva and Subramanya. In a later grant, Udayendiram grant of Nandivarman II16, Rajasimha is said to be devout worshiper of Shiva. In this situation, Parameshvaravarman I seems to be a better fit for our case. A support for the above case comes from a the Chola inscriptions found in this cave temple, in which the temple is referred as Parameshvara-mahavaraha-vishnu-griham. What the phrase ‘Parameshvara’ stands for in this inscription? Does this suggest that the temple was consecrated during the reign of Parameshvaravarman I or the phrase Parameshvara refers to Shiva? The former seems more appropriate as in many other instances, the temple or the god enshrined is named on the name of the donor or his/her parents in whose memory the temple is constructed. It seems unlikely that the phrase ‘Parameshvara’ would be referring to Shiva as the temple name suggests that it was a Vishnu temple and it is dedicated to him as well. So it seems clear that it was Parameshvaravarman I who consecrated this temple and it was he who would have engraved this imprecatory verse. But still we do not understand why he did this. The temple was started by his ancestors and in this case why would he do such a demeaning act. Support for this may come that as he is associated with few temples at Mamallapuram and this imprecatory verse is found on all of those, when he consecrated this Vishnu temple, he also put the imprecatory verse, though it has no meaning in the context. However, there is no consensus among scholars on who was king who engraved this verse. Some favors Parameshvaravarman I17 and some go for Rajasimha18, majority going for the former. An interesting truth is that we have few inscriptions at other places from the reign of Parameshvaravarman I and in those we do not encounter this verse. Also, we have many inscriptions of Rajasimha, also at other places, and there again we do not find this verse. It appears that this verse is only found in the shrines at Mamallapuram but nowhere else. We have seen these portraits above and also interpreted the inscriptions engraved on top of these panels. Also we have seen that this temple was consecrated during the reign of Parameshvaravarman I however its excavation might have been started during the reign of Narasimhavarman I. Let us now take a stand on the identification of the kings shown in the portrait panels. Case 1: Simhavishnu and Mahendravarman I – If the excavation was started by Mahendravarman I, then it would be easy to say that the portrait sculptures refer to the Pallava king Simhavishnu and Mahendravarman I. It would be appropriate for Mahendravarman I to show himself and his father in this Vishnu shrine. However, we know that the temple was consecrated during the reign of Parameshvaravarman I, could it be the case, that the excavation was started in Mahendra’s time and got completed in Parameshvara’s time? This seems highly unlikely, as Narasimhavarman I, son and successor of Mahendravarman I, ruled for good forty years and this time was enough to complete and consecrate this temple, if it was started during Mahendra’s time, even if in his late years. This identification has been supported by many scholars including Sivaramamurti19, Dehejia20, Lockwood21,T N Ramachandran28, R Gopalan29, S Krishnaswami Aiyangar30 and H Heras31. Case 2: Mahendravarman I and Narasimhavarman I – Not many scholars have proposed this identification, as I come across only H Krishna Sastri24 who has proposed such. Sastri studies the style of characters of the inscriptions and mentions that the characters resemble with the period of Parameshvaravarman I, when the script of the time of Mahendravarman I was not totally forgotten however new innovations were also taking place. However, can we rely on the style of characters when the period is so short like between Mahendravarman I and Parameshvaravarman I, about 70-80 years. In my opinion, this period is very short to carry out any comparative study on scripts. Case 3: Narasimhavarman I and Mahendravarman II – The seated Pallava king could be Narasimhavarman I as he bore title ‘Simhavishnu’ in his Badami inscription. Then the standing Pallava king might be Mahendravarman II. Though Mahendravarman II ruled for a very short period, however he might be involved in continuation of work on this temple. In this case, the only thing left for Parameshvaravarman I was to complete and consecrate the god in his name. And portraits of his father and gand-father, adoring this temple, would be very appropriate for Parameshvaravarman I. And probably this might be the reason, that though he was staunch Shaiva, but he consecrated this temple as the temple had royal statues and may be seen as the Pallava royal temple. But why Parameshvaravarman I did not put his portrait in the temple? One issue might be that as it was a Vishnu temple therefore the Shaiva king was not much interested. Another issue might be that, probably, portraits of living kings were not put into the temples. A support for the later theory comes from Partimanatakam of Bhasa22. भरतः – भवन्तं किञ्चितप्रच्छामि । धरमाणानामपि प्रतिमा: स्थाप्यन्ते ! When Bharata returned to Ayodhya, after hearing the episode of Rama-vanavasa, he stayed on the outskirts of the city waiting for the right mahurta to enter. There was a royal temple at the outskirts and Bharata had a look inside. He found portrait images of his ancestors Raghu, Dileepa and Aja. When Bharat asked the caretaker whether the images of living people are installed, the attendant answered in negative stating that images of dead people are only installed. If this is the case indeed, we get an answer why there is no portrait image of Parameshvaravarman though it was during his reign, the temple got consecrated. This view is supported by many scholars including Srinivasan23, Mahalingam25, V Venkatasubba Ayyar26. Case 4: Rajasimha and Mahendravarman III – The third and the last theory is that the seated king represents the Pallava king Rajasimha (Narasimhavarman II) and the standing king represents his son, Mahendravarman III. It is evident, in the Kailsanatha temple at Kancheepuram, that both the kings were involved in the construction of that temple and therefore the same might be the case with this cave temple. One issue with this theory is whether Rajasimha bore the title ‘Simavishnu’ or not? In his Kancheepuram inscription, where more than hundred of his titles are mentioned, this particular title is not mentioned. Also this title is not found in any of his other inscriptions, in this case how to ascertain that this Simhavishnu is Rajasimha? Another issue to tackle here is who engraved the imprecatory verse. Dehejia mentions that it was Rajasimha. We have seen above that Rajasimha was told to be a staunch follower of Bhagvat (Vishnu), Maheshvara (Shiva) and Brahmanya (Subramanya) in his Reyuru grant. Udayendiram plates of a later period, time of Nandivarman II, mentions Rajasimha as devout worshiper of Mahesvara. Reyuru plates were issued in the twelfth regnal year and Rajasimha ruled for good thirty years, is there a possibility that in his later period, he became more inclined to Shiva? We do not know. in the other inscriptions of Rajasimha, Saluvankuppam cave inscription, at Mamallapuram, we do not find this imprecatory verse. This raises a question that why he did not include this verse to an inscription which is of his without any doubts. In such a situation, associating Rajasimha with this imprecatory verse is very dicey. Also this makes rather difficult situation to identify the kings as Rajasimha and Mahendravarman III. We do not have many scholars supporting this identification except Nagaswamy27. Conclusion – The imprecatory verse found at Mamallapuram is associated with Parameshvaravarman I as there is no other Pallava king fitting into the context. However it would be really interesting to understand why this verse was included only in the inscriptions at Mamallapuram. The Pallava kings in the portraits should be identified with Narasimhavarman I and Mahendravarman II as other suggested cases do not fit to the context as discussed above. On the lintel above the Harihara image – cg 100 of A Topographical List of Inscriptions in the Tamilnadu and Kerala States vol III – not dated – Enumerates ten incarnations of Vishnu, as Matsya, Kurma, Varaha, Narasimha, Vamana, Rama, Rama, Rama, Buddha and Kalkin. The three Ramas of the inscriptions should be taken as Parashurama, Rama the son of Dasharatha and Balarama. On a slab built into the floor in front of the temple, near bali-pitha – cg 104 of A Topographical List of Inscriptions in the Tamilnadu and Kerala States vol III – refers to the Pallava king Nandivarman II – dated to sixty-fifth regnal year, corresponding 796 CE – mentions purchase of land by Idaivalanchan Kandan, son of Ilam-Paduvumar, the headman of Kunrattur in Amur-nadu, a merchant of Mamallapuram, in lieu of gold. Boundaries of the land are specified. Among the boundary are two tanks, Kon-eri and Mandai-talaivan-eri. On a niche in the temple – cg 108 of A Topographical List of Inscriptions in the Tamil Nadu and Kerala States vol. III – refers to the reign of the Chola king Rajendra II – dated in the ninth regnal year, corresponding 1061 CE – The Chola king is referred as Parakesarivarman alias Udaiyar Sri Rajendra-deva. It records a tax free gift of land by the nagarams and perilamai of Mamallapuram alias Jananathapuram to the god Sri Parameshvara-Mahavaraha-Vishnhu-griha. Mamallapuram was a nagaram in Amur-nadu in Amurk-kottam, a sub division of Jayangondachala-mandalam. On a niche in the temple – cg 109 of A Topographical List of Inscriptions in the Tamil Nadu and Kerala States vol. III – refers to the Chola king Rajendra II – date is not clear, approximate date 1052 CE – mentions a tax-free land donation to the temple of Parameshvara-mahavaraha-vishnu-grihattalvar at Mamallapuram by the village of Tiruvelichchil. 2 Lockwood, Michael. Mamallapuram. p 147. 3 Lockwood, Michael. Mamallapuram. p 144. 4 Sastri, H Krishna. Two Statues of Pallava Kings and five Pallava Inscriptions in a rock-cut Temple at Mahabalipuram. p 2. 5 Lockwood, Michael. Mamallapuram. p 140. 6 Gopalan, R. History of the Pallavas of Kanchi. p 87. 8 Sastri, H Krishna. Two Statues of Pallava Kings and five Pallava Inscriptions in a rock-cut Temple at Mahabalipuram. p 4. 10 Lockwood, Michael. Mamallapuram. p 142. 11 Sastri, H Krishna. Two Statues of Pallava Kings and five Pallava Inscriptions in a rock-cut Temple at Mahabalipuram. p 4. 12 Mahalingam, T V. Inscriptions of the Pallavas. Inscription no 43. 28 Ramachandran, T N. The Royal Artist, Mahendravarman I.